Fort Fairfield - Joyce Marie Craig Plant, 91, passed away on March 4, 2019 at the Presque Isle Rehab and Nursing Center in Presque Isle. She was born on May 5, 1927 in Woodstock, New Brunswick, Canada, to Nelson W. and Queenie V. (Dickenson) Craig. Joyce grew up in Lower Woodstock, New Brunswick and graduated from Woodstock High School in 1944. After high school she attended Vocational School in Woodstock. She worked for many years in Presque Isle at the Opportunity Training Center working with special needs children, many times bringing the kids to her home to provide a good meal and loving environment. She went back to school at the University of Maine Presque Isle and received her Bachelor’s Degree in Elementary Education in 1971. She then taught in the Fort Fairfield schools for 24 years teaching first grade until retiring in 1996. Joyce married Willard M. Plant on May 4, 1947. They were happily married for 40 years. 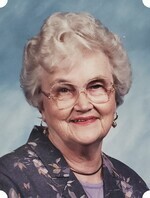 Joyce was a member of the United Parish Church in Fort Fairfield. She enjoyed sharing the ministry as a guest speaker at area churches and singing in the church choir. Joyce is survived by her children: Lawrence Plant and spouse Narda of Fort Fairfield, Roger Plant and spouse Elizabeth of Gorham; sister-in-law, Margery Craig of Lower Woodstock, New Brunswick. She has 5 grandchildren: Christopher Plant and spouse Patricia of Hampden, Melissa (Plant) Bishop and spouse Brian of New Hampshire; Andrew Plant and spouse Jennifer of Presque Isle; Julie Plant and spouse Maris Prichett of Medford, Mass. ; and Michele (Plant) Higgins and spouse Andrew Higgins of Gorham. She also has 10 great grandchildren who she always enjoyed seeing, singing and sharing treats. Joyce was preceded in death by her husband Willard M. Plant in 1987, her parents Queenie and Nelson Craig as well as her brothers Burton, Wesley and sisters Marguerite Nicholson and Lillian Craig. Friends may call at the Giberson-Dorsey Funeral Home 144 Main Street Fort Fairfield on Friday March 15, 2019 from 7-9 P.M. A funeral will be held at the United Parish Church, 4 Church Street, Fort Fairfield on Saturday March 16, 2019 at 11:00 A.M with Rev. Meg Hegemann officiating. There will be a reception after the service in the church fellowship room. A Committal Service will be held in the spring at the Riverside Cemetery, Fort Fairfield. In lieu of flowers the family requests memorial donations be made to: The United Parish Church Memorial Fund, c/o Jane Hunt, P.O. Box 407, Fort Fairfield, Maine 04742. Envelopes will be available at both the funeral home and church. Online condolences may be expressed at www.gibersondorseyfuneralhome.com .